Example of an old tire with not enough tread to displace water from beneath it. In Phoenix, we all know we don’t get much else besides sunshine 9 months out of the year, so most of us have low tread tires, because, well, why not? It’s cheaper, there’s no snow, and hardly any rain and our tires do the job just fine. “‘CUE’ the monsoons”. With low tread tires, this deprives the tire tread of its vital job in life, to move water. The channels in the tread act as passages for water to escape from underneath the tire. The deeper the tread, the deeper the water passage and the more water that can be displaced. When enough water can’t be moved through the tread, the tire can ride on the water, this is most commonly referred to as hydroplaning. The tire loses all contact with the road and is gliding on the water so there is, little, to no traction and your car can slide. Somewhere between a brand new tire and a bald tire lies the point at which the tire should be replaced. Phoenix drivers can easily do the penny test. 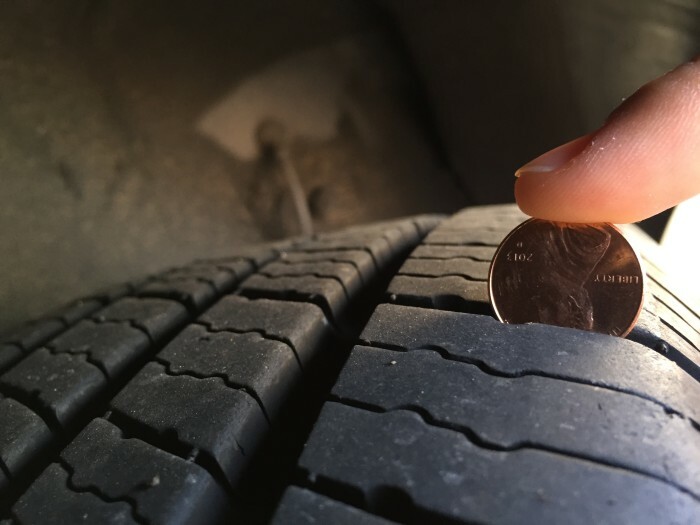 Just place a penny head first into various tread grooves across the tire. If you always see the top of Lincoln’s head, your treads are shallow and worn and need new tires. However, if part of Lincoln’s head is always covered by the tread, you have more than 2/32 of tread depth and can squeak by this monsoon season. And who says a penny doesn’t buy you anything? It just bought you peace of mind when it comes to your tires and safety. Example of a new tire. It isn’t an all weather tire, but it has enough tread to displace water from beneath it. 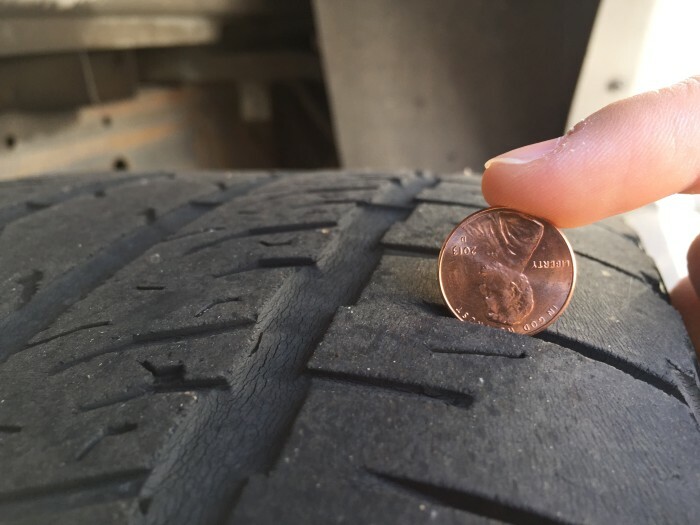 Studies have shown, however, that there is an important difference in stopping distances for motorists in dangerous wet Phoenix conditions with tires that have more wear. For example, in controlled, wet conditions a vehicle with 4/32 of an inch of tread traveling at freeway speeds was able to stop about 85 feet sooner than the same car with tire tread at 2/32 of an inch. That could easily be the difference between a safe stop and hitting the car in front of you. New tires are valuable items for Phoenix motorists in the monsoon season, so it’s natural to want to get the most out of them. Just remember that a huge part of that value is the ability to drive and stop safely, even in wet Phoenix conditions. If you’re not sure whether you need new tires, swing by Service Techniques and we will give you a free assessment.